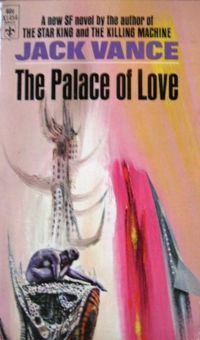 This may come as a surprise to some readers, but The Palace of Love is not about the Neverland Ranch! In fact it is the third installment of the Demon Princes series by Jack Vance. The premise is as simple as an old-time Western. Kirth Gersen is the survivor of the Mt. Pleasant massacre, an incident where five interstellar gangsters known as "The Demon Princes" murdered or enslaved an entire community. Gersen has dedicated his whole life to revenge. He's bumped off Malagate the Woe, and Kokor Hekkus the Killing Machine, now he's gunning for Viole Falushe. Accompanied by a young lady he rescued in the last book, Gersen visits Sarkovy. Readers who have been paying attention will recall that this is the home of the Venefices, the galaxy's most accomplished poisoners. Vance lets his imagination run free in depicting the gloomy, barbaric, and paranoid world of Sarkovy. Vance conjures a world of swamps, forest, and endless steppes where every man is an expert biochemist, though of a very specialized kind. They have developed poisoning to a level beyond an art form, but to the basis for everyday life. That's just the opening chapters. Gersen picks up the trail of Viole Falushe, an accomplished slaver who specializes in trafficking in young women. To ferret him out, Gersen must travel to Earth and find Falushe's hometown. There he meets a mad poet and a nameless young woman. Gersen must understand what led a high-school nerd to kidnap an entire girls' choir (save one lucky, or perhaps unlucky, young lady) and embark on a life of crime and sexual excess. As always, Vance's villain takes something of a back seat to the meticulous and detailed depiction of the odd personalities and even odder societies Gersen encounters on his quest. This is truly baroque space-opera, where the tattoos on a man's face and feet signify his rank and religious affiliation. A masked ball at a country estate might unmask a killer or could be a bizarre bohemian prank. An entire society runs off the proceeds of prostitution. These are just some of the quaint and curious things found in The Palace of Love. For SF that leaves the reader with a sense of wonder, Vance cannot be beat.